Team Sky has been deposed from its long run at the top of the 2015 UCI WorldTour team ranking by Etixx-QuickStep thanks to Michal Kwiatkowski’s win in the Amstel Gold Race on Sunday. Kwiatkowski’s victory in the Dutch race was the first WorldTour win for Etixx-QuickStep since the Polish road race world champion also won the prologue of Paris-Nice on March 8. 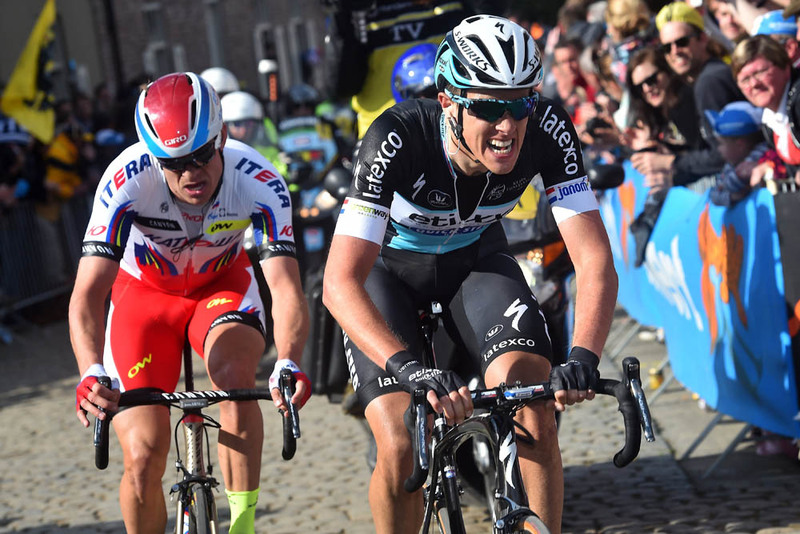 Those two victories are the only WorldTour wins scored by the Belgian team so far in 2015. Etixx-QuickStep has endured near misses in Paris-Roubaix (Zdenek Stybar second), the Tour of Flanders (Niki Terpstra second), Ghent-Wevelgem (Terpstra second) and E3 Harelbeke (Stybar second, Matteo Trentin third), as well as second places in: Paris-Nice, three Volta a Catalunya stages, a stage of the Tour of the Basque Country and a stage of Tirreno-Adriatico. By consistently placing second, Etixx-QuickStep has managed to accumulate enough points to better Team Sky, despite the British team’s Richie Porte winning the Volta a Catalunya and Paris-Nice, as well as second overall in the Tour Down Under in January. Porte does, however, safely retain his position at the top of the WorldTour rider ranking ahead of Tour of Flanders winner Alexander Kristoff (Katusha) in second and Paris-Roubaix/Milan-San Remo winner John Degenkolb (Giant-Alpecin) in third. Kwiatkowski moves up to fourth spot, nudging Geraint Thomas (Sky) down to fifth. Thomas is the highest-ranked British rider in the table. With two WorldTour races this week in the shape of Fleche Wallonne (Wednesday, April 22) and Liege-Bastogne-Liege (Sunday, April 26) it’s likely that the WorldTour rankings will shift again prior to the start of the first Grand Tour of the season, the Giro d’Italia from May 9 to 31.